DIRECTIONAL WARM-UPS FOR BAND was written for use by mid-level and developing high school bands or advanced middle school groups. Higher-level ensembles could use the material for review or at the first of the concert season to reinforce concepts of ensemble playing, tone, intonation, etc. Of course, the chorales are useful for groups of any level, at any time. Originally published by Warner Bros./Belwin-Mills in 1996, it was removed from print in 2005 when Warner Bros. Music was sold to Alfred Publishing. I was able to negotiate the return of full rights to the series in 2009. Although no longer printed with a color cover, I have painstakingly corrected every known error (missing crescendo, wrong note, etc.) in every book of the series. This is the type of warm-up book I always wanted when I was teaching public school. Today I routinely use it with my college band. I hope you, too, will find it useful! 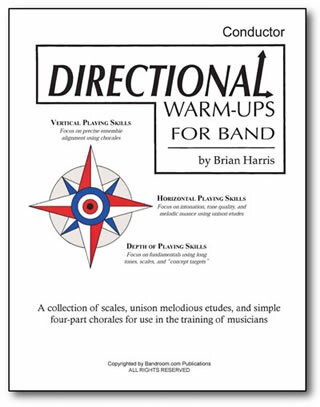 DIRECTIONAL WARM-UPS FOR BAND addresses playing skills in three dimensions/directions: horizontal, vertical, and depth. Horizontal skills include phrasing, melodic nuance, and interpretation. These are developed through melodious unison etudes. Vertical skills, such as ensemble attacks/releases, balance, blend, and intonation are developed through simple chorales that allow the player to clearly hear problems - not only their own, but across the entire ensemble. Depth of playing skill for the individual is accomplished through the use of varying scales, key signatures, rhythms, meters, and terminology. Contains 16 Learning Units and 20 Chorales. Each Learning Unit contains a unison scale, melodic etudes, and references a Chorale in the same key. For teaching purposes, the scales are first presented in whole notes (with accidentals as needed). This line is then followed by a rhythmic pattern scale, up and down, including the arpeggio. Each of the eight Learning Units in major - B flat E flat A flat D flat F C G C keys have a unison scale and two unison etudes, one simple and the other more difficult. Each of the eight Learning Units in minor - G C F B flat D A E B keys have a unison scale in natural, melodic, and harmonic forms, and a single advanced etude. The 20 traditional, four-part chorales are arranged with simple rhythms to focus attention on vertical playing skills (ensemble). Part books indicate whether the player has the Soprano, Alto, Tenor, or Bass line - this allows you to rehearse similar parts for intonation and balance purposes, as well as finding who is playing those wrong notes (!). The omission of dynamic indication encourages students to follow the conductor's gestures. The Conductor Score has both a condensed 4-line score and a full score of each chorale (sample). Also included are 32 Rhythm Patterns, a Piano Keyboard diagram (for teaching step patterns of scales), and a Glossary of musical terms used in the book. The Conductor Score has several pages of instructions for using the method books to improve your band and suggestions for implenting a varied warm-up in order to achieve maximum learning. Listen: A few years after writing this method, I used one of the included 20 chorales (#14) as the basis of a simple warm-up method (Concert F Warm-Up). You can listen to that chorale here. SPECIAL PRICE - Receive a 30% discount off the combined price of the individual book sets if you purchase the entire series (PDFs for the score, all 25 part books, and site-license to print as many copies as needed by your school/institution): $225.00 US. Percussion - The series includes 3 separate books for use by the percussion section - a Timpani book (written for 2 or 3 drums), Mallets, and Percussion (snare and bass drum). Much attention was given to keeping the percussion and timpani parts as interesting and active as possible to cut down on boredom for that section of the band (I'm sure you know why!). If you are an owner of the original 1996 printings with the blue cover, you may wish to peruse this errata sheet. All of these errors have been corrected in the copies I am selling, which may be used with the original publications (only a few minor changes were made regarding the layout of pages).